Sooner or later, everyone winds up in front of The Judge. If the part of a judge is a small role, it is generally filled by stern black women (with hair pulled tightly back) or gruff older white men. Sometimes these archetypes mix, leading to the stern, slightly below middle age black male or white female judge. If there's a tribunal or other situation with more than one judge, both the stern black woman and the gruff older white man will usually appear, though a Bald Black Leader Guy is a distinct possibility. For example, Charlton Heston played the gruff older white man in one of the last episodes of the 90s Outer Limits, and there was also a stern black woman present. It's been said that the above-average presence of black judges in popular media, particular American television is a sort of Political Correctness Gone Mad designed to show African-Americans in positions of authority. This is often a convenient Cop Out in shows that otherwise feature very few black characters of any importance. 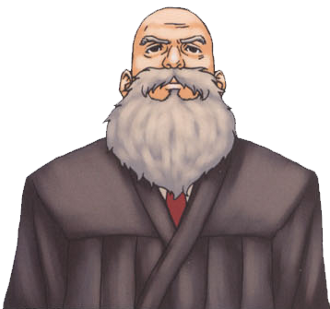 Video game example: The nameless Judge and his brother (also a judge) from Phoenix Wright: Ace Attorney and its sequels. He does not resemble the typical judge seen in Western fiction, as he is indecisive at times and is often very forgiving to the defense. The prosecution, however, can manipulate him very easily, often to the point of doing his job for him. Despite the fact that he's outright senile at times, he's supposedly renowned as a fair judge who almost always hands down the right verdict. Also, the judge's brother is Canadian. For some reason. Ace Attorney Investigations 2 has Hakari Mikagami, a relatively young female judge who, unlike The Judge and his brother, is all business. This is quite unfortunate for Edgeworth, since she's part of the Prosecutorial Purge Committee and hopes to put an end to his career because she believes he is breaking rules and overstepping his bounds in his investigations. One or more examples is visible in every episode of every series in the Law and Order franchise. The judge on The Simpsons is a Judge Roy Snyder, a gruff older black man, sort of combining the two archetypes. They also have Judge Constance Harm an over-the-top caricature of TV's Judge Judy. The Dark Knight has an stern, older woman as judge. She gets killed by a car bomb. This is Wonderland had many judges, being a courtroom drama and all. Perhaps the sternest of them was the African-Canadian woman. There were two old white men, one of whom was the Mental Health Court judge and the Nicest Guy imaginable, although he got pretty tough in Plea Court. The other was a eccentric snarky Jerk with a Heart of Gold and a clown fixation. Star Trek: Deep Space 9's Odo got Judge-like as the series got more and more Arc-ish. Averted on Night Court, where the judge is not only the main character but a happy-go-lucky young white guy. There was a TV Show called The Judge, starring Robert Shield. Silvester from Shape Quest is a high judge in his own country. The Rocky and Bullwinkle movie had Whoopi Goldberg as Judge Cameo. Judge J.J. Ford, from the children's mystery novel The Westing Game, fits the stern black woman version of this trope perfectly. She does mention that she worked hard to be the first black or female judge in the state's history. Taken to the logical extreme with Oprah Winfrey as the judge in Bee Movie. Futurama had Judge Whitey, and older white man with a prep accent. Judge Weaver in Anatomy of a Murder was played by Joseph N. Welch, a Real Life lawyer most famous for his Take That against Senator Joseph McCarthy ("Have you no sense of decency, sir?") during the 1954 Army–McCarthy hearings. Welch joked that he took the movie role because it was the closest he'd ever come to being a judge. Both versions have appeared a couple of times on CSI. Averted in Arrested Development, where the semi-recurring and somewhat bemused Judge Ping (presiding George Bluth's trial) is played by the Chinese American Michael Paul Chan. Generally averted on The Practice. Most judges with recurring roles had physical oddities, semi-disruptive personality quirks, or both. In The Hurricane, The Judge appears memorably at the film's end with the trial. In The Butterfly Kid, one spontaneously appears (along with a court room) when someone mentions a trial for the alien invaders who have just been defeated. Although the heroes aren't entirely sure he's real (It Makes Sense in Context), the aliens take him very seriously. The Judge in the underworld court in The Grim Adventures of Billy and Mandy is likely the Only Sane Man in the cast, constantly annoyed by the shenanigans that happen whenever he has to preside over a case involving the main cast. This page was last edited on 12 September 2018, at 16:36.